Wheeler Hinshaw has an abscess on his heel and has been absent several days this week. We hope for his recovery soon. Linneus Hinshaw is back to school after having his tonsils removed. 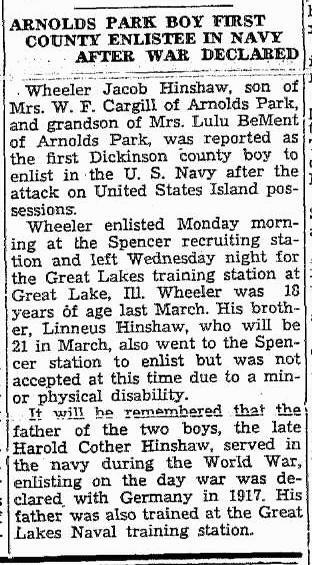 On Monday, December 15, 1941 Wheeler Jacob Hinshaw, age 18, enlisted in the U.S. Navy at the Spencer recruiting station.8 Wheeler was reportedly the first in Dickinson County, Iowa to enlist in the U.S. Navy after the attack on Pearl Harbor.8 (see newspaper article scan below). Mr. and Mrs. Wheeler Hinshaw and son of Arnolds Park spent the week end with his parents, and grandmother, Mr. and Mrs. Wm. Cargill. and Mrs. Luella Bement. Wheeler Hinshaw of Arnold's Park was a weekend guest of his mother, Mrs. Wm. Cargill. Mrs. Nellie Allen, who had been caring for Mrs. Cargill's mother, Mrs. Bement, returned home with him. Rev. Paul Biaotto, pastor of the Friends' Church at Arnolds Park, came Friday for an afternoon's visit with "Grandma" Bement, who is seriously ill at the home of her daughter, Mrs. W. F. Cargill. The church of which he is pastor was founded by Rev. Jacob Hinshaw, great grandfather of Linneus and Wheeler Hinshaw, the former of whom (Linneus Hinshaw) lived at Nashua at one time. Rev. Biaotto was accompanied here by Ivan Whipple of Arnolds Park. Wheeler Hinshaw and family of Arnolds Park were weekend visitors here in the home of the former's mother, Mrs. Cargill. Mrs. Wheeler Hinshaw of Arnolds Park came Thursday and visited her mother, Mr. and Mrs. Frank Abrams until Saturday. Mrs. Wheeler Hinshaw of Arnolds Park came Tuesday to visit her parents, Mr. and Mrs. Frank Abrams. Mrs. Abrams is a patient in the Guthrie county hospital. Mr. Hinshaw came on Wednesday for a visit. Mr. and Mrs. Wheeler Hinshaw and Mr. and Mrs. Scott Menefee of Arnolds Park were Saturday night guests of Mrs. Hinshaw's father Frank Abrams. Sunday they visited Mrs. Hinshaw and Scott's mother, Mrs. Abrams at the Guthrie County Hospital. Wheeler Hinshaw and son of Arnolds Park came Sunday to move the rest of Frank Abrams' furniture to Arnolds Park. Mr. and Mrs. W. J. Hinshaw and four sons of Arnolds Park and Mr. and Mrs. Ed Miller and family from Bristow were visiting at the W. F. Cargill, Sr. home. Linn Hinshaw will be staying there for two weeks and then will be returning to his job at the Morning Democrat and the Daily Times at Davenport. Sunday guests of Mr. and Mrs. W. F. Cargill, Sr., were Mr. and Mrs. W. J. Hinshaw and sons, Robert and Eric of Arnolds Park and Mr. and Mrs. Keith Cargill and Melvin. Contribution from Michael Todd Hinshaw. Contribution from Spencer L. BeMent (). 1925 Iowa state census, Arnolds Park, Dickinson County, Iowa. 1930 census, Arnolds Park, Center Grove Township, Dickinson County, Iowa; roll T626-651, ED 1, page 2B, line #95, dwelling #55, family #56. "Spirit Lake Beacon", Sep 22 1932; http://www.ancestry.com. "Spirit Lake Beacon", Dec 18 1941; http://www.ancestry.com. The "The Guthrian", Jan 29 1963; http://www.ancestry.com. 1930 census, Beaver Township, Guthrie County, Iowa; roll T626-656, ED 4, page 5A, line #19, dwelling #98, family #98. The "Nashua Reporter", Sep 6 1948; http://www.ancestry.com. The "Nashua Reporter", Jan 21 1954; http://www.ancestry.com. The "Nashua Reporter", Feb 18 1954; http://www.ancestry.com. The "The Guthrian", Oct 8 1963; http://www.ancestry.com. The "The Guthrian", Nov 12 1963; http://www.ancestry.com. The "The Guthrian", Jan 21 1964; http://www.ancestry.com. The "Nashua Reporter", Apr 23 1964; http://www.ancestry.com. The "Nashua Reporter", Jul 22 1965; http://www.ancestry.com.